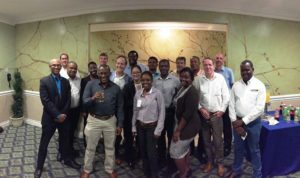 Senior technical staff of the region’s rum producers, members of the West Indies Rum and Spirits Producers’ Association (WIRSPA), met in Jamaica on 13 June 2018 for a one-day technical meeting, to address a range of issues, which impact on the region’s largest and premier agro-based export product. Producers from Antigua, Barbados, Dominican Republic, Grenada, Guyana, Jamaica, Suriname and St. Lucia came together to discuss matters relating to rum origin and trade rules, to examine the latest developments in labelling globally, and plans for upgrading regional labelling for rum. Attendees exchanged views on the CARICOM rum standard which governs how rum can be made and quality ensured. The meeting also examined new technological solutions in the industry and exchanged views on the state of molasses supply in the region. As part of ongoing WIRSPA actions to promote quality products and international best practice, senior technical staff from member companies across the Caribbean region meet biannually to examine technological and regulatory developments affecting the sector, and to learn from their counterparts, to ensure that the region’s rum industry continues to produce the highest level of quality.